Today’s photo is of Teloschistes exilis, or the slender orange bush lichen. It was submitted to the Botany Photo of the Day Flickr Pool by Roy Cohutta@Flickr (aka Roy “Cohutta” Brown). Roy took this photo in southwest Georgia’s Dougherty County (USA). Thanks Roy for sharing your photo! Teloschistes exilis, of the Teloschistaceae, is one of six North American species within the genus. This lichen is a classic two-species lichen symbiont, with a photobiont green algae from the genus Trebouxia collaborating with a mycobiont ascomycete fungus. A branch-dwelling entity, Teloschistes exilis is also considered a tufted and fruticose lichen (lichens are typically categorized by growth habit). When fertile, the narrow and round branches will form large orange nonciliate apothecia. 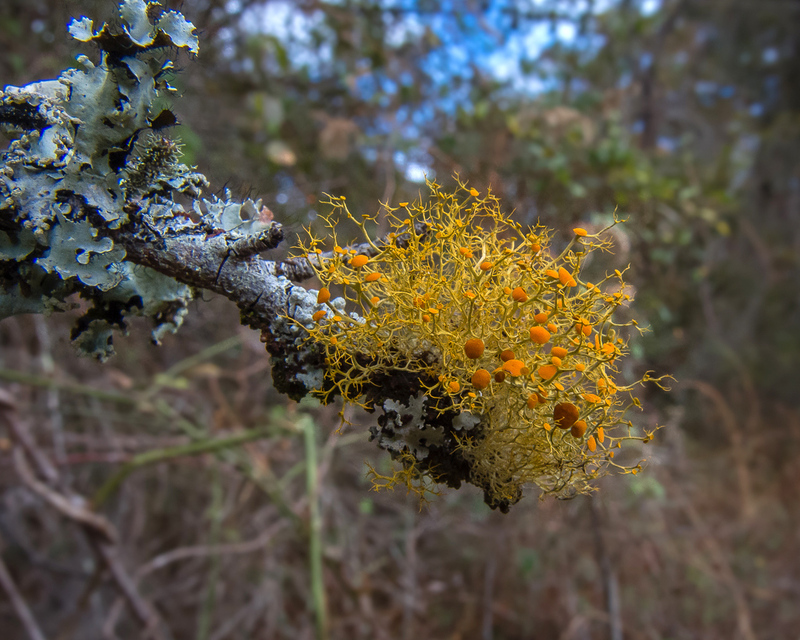 The slender orange bush lichen reproduces by releasing spores from asci. There are 8 ascospores to each ascus, and the asci are housed within the apothecia. This species lacks soredia, or propagules of fungal hyphae wrapped around green algae. These are employed by some lichen species as a mechanism for asexual reproduction (information about today’s species gleaned from Irwin Brodo’s Lichens of North America). As epiphytic lichens are known to be sensitive to phytotoxic gases (gases that are toxic to plants) and polycyclic aromatic hydrocarbons (atmospheric pollutants), they are often used as biological indicators to monitor air quality. Unlike the leaves of vascular plants, lichens have no stomata or cuticle, so gases and aerosols are readily absorbed by the thallus (or body of the lichen). In a study by Käffer et al. from the Federal University of Rio Grande do Sol, Parmotrema tinctorum (a foliose lichen) and Teloschistes exiles were grown and used to monitor the presence of pollutants in an urban area of southern Brazil. After exposing the lichens to the environment for several months, the study noted: 1) pollutant accumulation depends on the morphology and physiology of the lichen species; 2) pollutant accumulation varied by pollutant type; and 3) pollutant accumulation is influenced by regional climate and meteorological conditions. Inorganic pollutants measured within the thalli included sulfur, lead, chromium, mercury, and zinc. Higher concentrations of pollutants were found in Parmotrema tinctorum compared to Teloschistes exilis, leading the authors to conclude that Parmotrema tinctorum is a more effective bioindicator for the region (see: Käffer et al. 2012. Use of bioindicators to evaluate air quality and genotoxic compounds in an urban environment in Southern Brazil. Environmental Pollution. 163:24-31). Gorgeous photo. I love the colors. This is just the kind of refreshingly whimsical (to borrow above Jessica’s fine word) yet pragmatic and fascinating science for which we love BpotD. Undiluted science that a person can still relate to. Thanks Daniel. Wow! Really cool. And yes, it does look otherworldly! Fascinating! Thank you for sharing all your excellent info! FYI: I sent this link to a fellow gardener and blogger (in N.H.) who is somewhat of a lichen specialist. I think he’ll appreciate this photo of the day immensely! Simply gorgeous. Thank you for the posts and the information. These wonderful photos and articles bring pleasure to this reader in drought-stricken southeastern Colorado. Beautiful, really seen when viewed large.